Oh my gosh this book is on here yay!! I may or may not have taken this from my grandparents house years ago and kept it in my room hehe. And boy am I GLAD since there's been other kids books (OLD books) gone at my grandparents house and ones that I loved to listen to when my grandpa read them to me at a young age. This book I'm keeping my mouth shut they I have it ;) but it's a REALLY REALLY OLD copy and so precious to me I'm definitely going to keep this for my future kids one day when I get Married and have a family of my own. This book will ALWAYS ALWAYS be a favorite and with my grandpa being 89 this year, I'm definitely going to have amazing memories of him reading this particular book to me as a little girl. Yes it came out in 1968 (which this copy literally did look like it came out the year it was published and the pages are still perfectly preserved) and it's such a cute little book. I don't put a ton of children's books on my read lists and mainly like to count my own books but this is one that's an exception. So if you haven't read this book and it's available, read it! I loved this sooooo much! Well, *I* am charmed. And young me would have been. But today's kids, maybe not. It reads like a simply silly adventure, until a reread reveals the subtle magic about a lonely child, and a not-quite-so-lonely ghost, and how they ease each other's burdens. The days of childhood innocence are long past for me. As time progressed new challenges were faced. Many of us were forced to grow up too fast. Innocence was buried and imagination and creativity was shelved to learn other skills.I decided to see what it would be like to return to some books that I loved during childhood. There were two in particular that I thought of but it was A Ghost Named Fred that I found first. Like destiny, it just appeared in my house one day. I began to read it. Our story opens up with a young boy named George. George is presumed to be around 5-7 years old. Unfortunately for George, there is nobody for him to play with that is his age. There is obviously an absence of a mother and father figure. George takes refuge in his imagination to pass the time. One day George pretends to be an astronaut He soon ventures very far away from home as becomes lost. He gets what he wants. Day soon turns to night and rain begins to pour. Without hesitation, George runs to a old house showered in darkness. In this house he finds a ghost named Fred. The book consists of dialogue between George and Fred and their search for treasure (a search for eternal companionship that George seeks). This book is about the beauty of pure imagination that we are gifted as children. Paired with the search of an father figure (found in George) and the entertainment of unhinged fantasy that the too merge with each other, this children's book runs deep in the roots of all of us. I think its good for us to look back and find that roses we forgot to appreciate the smell of and savoir it one last time. Writing and pacing is what you would expect, but it never bores. On the entertainment director scale this book receives a Stephen Spielberg post ET. The illustrations happened to be unique and intriguing. I did not like the sudden ending of the book but I found myself to be satisfied. Summary: While playing outside, George finds shelter from the rain in an old abandoned house. To his surprise, he meets a ghost named Fred.Evaluation: I give this book a 5 stars. It is appropriate for 1st and 2nd grade students. The words a bold and the sentences have plenty of space in between for beginning readers. The pictures help students make connects with the text by providing context clues. This is a good book for new readers. Teaching Point: I could use this book when teaching students to use their context clues. If students have trouble figuring out how to sound out the word astronaut (Pg. 13) they can look at the picture and figure out what the word could be. There are plenty of context clues throughout this book. Summary: A small boy finds shelter from the rain in an old house and meets a ghost'named Fred. Colorful illustrations plus a mystery which will delight 1st- and 2nd-grade readers. Award-winner: Children's Books of 1968 (Library of Congress)Potential Audience (reading level): k-2; late emergent/earlyGenre: Fictional picture bookTopic: imagination, ghosts, adventure for lost treasureSpecific curricular uses: This would be a good guided reading book for second graders. Model how to read the book aloud to the students first, and let them go through again and read on their own. Social issues the book addresses: Using imagination to combat boredom, encounters with the paranormalSpecific literary elements: Dialogue is effective in creating suspense in the plot, and it also establishes interaction between the boy and the ghost.Interactions and counter actions of text and images: Colorful images support, but do not really add anything to the understanding of the text. It is fun, however, how the ghost is drawn in many different ways. For instance, sometimes just his eyes appear. Other times, he's floating, hanging upside down, or walking through a door. Ages 6-8. This green level, intermediate easy reader book depicts a young boy who, upon finding himself lost in the rain, goes into an old house and befriends a ghost. Together, they hunt for the treasure the ghost is supposed to be guarding but cannot remember the location of. The dark,shadowy backgrounds in these illustrations contrast with the bright objects int he forefront. The highlight of this story might be that it turns something which is traditionally considered scary--a ghost--on its' head and makes it seem quite likable. Some parents may find it unsettling that it features a small child whose solution to getting lost is to enter a an abandoned, scary looking home. However this story opens up an opportunity for parents to discuss with their children what a good action plan might be if the they do get lost. This book would be a wonderful addition to a public library or elementary school's youth collection. What an enjoyable story! This timeless classic tells the tale of a young boy who meets a ghost in an abandoned house while he is out playing. My son enjoyed hearing this tale and gives it 5 stars. I'm a bit more conservative with my stars, so I give it 4 to 4.5 stars. The one thing about this book is that it was written in a time (1968) when children going in to a strange house in the neighborhood did not send chills down a parent's spine. However, I did find that it did open up a conversation between my son and I about not going in to stranger homes, in a very non-threating way. I recommend this book for an enjoyable read for beginning readers to share with a parent or for a more advance reader to try on their own. George has no friends. He makes up games and imaginary friends to play with. One day, while pretending to be an astronaut, it starts to rain. He enters an old house to find shelter from the rain and there he meets a ghost named Fred. Fred is guarding a treasure that only he knows where it is hidden. But Fred soon realizes that he actually cannot remember where the treasure is. George agrees to help him find it. A fun book to read around Halloween because it deals with ghosts. Our class could go on a treasure hunt. This is a story about George who had no one to play with so he would make up is games and pretend to be a cowboy, a pilot, or even a submarine. One day he was outside pretending to be an astronaut and become lost. It started to rain, so he went inside to a big dark house to get out of the rain. That is when George meets Fred, a friendly ghost and Fred wants George to help him find where he left his treasure because Fred the ghost could not remember. This story was okay and I would recommend it for early readers pre-K to 2nd grade Published 1968. When we chose this book from the library, we were a little concerned that it might be too scary for a 4-year-old, especially the part where the ghost follows the boy around the house, then materializes eyeballs first. Instead, Lenore adored the book. We read it over and over until she memorized it all. Then she enjoyed "reading" it to us. She found the friendship between the boy and the ghost utterly charming. My five-year-old son picked this book out from the library yesterday. I think my brother might have helped. Oh my goodness! Where was this little gem when I was growing up?! Why did no one buy it for ME? Seriously, I loved this book so much, I am going to have to look for more books by Nathaniel Benchley (related to Robert, maybe?). Luckily for me, my son inherited my rather dark sense of humor and loved this book as much as I did. A great I Can Read book. Creepy enough in the beginning, but not too scary. A ghost, Fred, is guarding a treasure in a haunted house, but he can't remember where it's hidden. Good for first and second grades! This is a cute book for Halloween. I really enjoyed this book. I thought it was great to introduce mysteries to kids, not scary at all and the ghost named Fred was really friendly. Leuk voorleesboek voor de allerkleinsten. Begint een beetje griezelig maar alles komt al snel goed. Nathaniel Benchley Ben Shecter - Born in Newton, Massachusetts to a literary family, he was the son of Gertrude Darling and Robert Benchley (1889-1945), the noted American writer, humorist, critic, actor, and one of the founders of the Algonquin Round Table in New York City.Nathaniel Benchley was the highly-respected author of many children's/juvenile books that provided learning for the youthful readers with stories of various animals or through the book's historical settings. 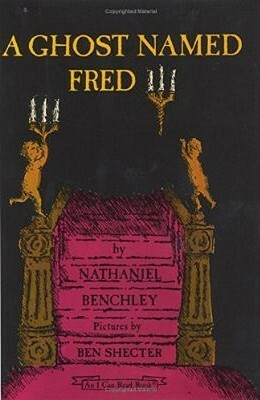 Benchley dealt with diverse locales and topics such as "Bright Candles", which recounts the experiences of a 16-year-old Danish boy during the German occupation of his country in World War II; and "Small Wolf", a story about a Native American boy who meets white men on the island of Manhattan and learns that their ideas about land are different from those of his own peoples'.Film director/producer, Norman Jewison made Benchley's 1961 novel The Off-Islanders into a motion picture titled The Russians Are Coming, the Russians Are Coming for which he received the nomination for an Academy Award for Writing Adapted Screenplay. He was a close friend of actor Humphrey Bogart and wrote his biography in 1975.Benchley's novel Welcome to Xanadu was made into the 1975 motion picture Sweet Hostage.His elder son, Peter Benchley (1940-2006), was a writer best known for writing the novel Jaws and the screenplay of the 1975 Steven Spielberg film made from it. His younger son, Nat Benchley, is a writer and actor who has portrayed his grandfather, Robert Benchley, in a one-man, semi-biographical stage show, "Benchley Despite Himself". The show was a compilation of Robert Benchley's best monologues, short films, radio rantings and pithy pieces as recalled, edited, and acted by his grandson Nat, and combined with family reminiscences and friends' perspectives. "Nathaniel Benchley died in 1981 in Boston, Massachusetts and was interred in the family plot at Prospect Hill Cemetery in Nantucket.